Tidal lagoon is type of tidal power production which is much similar to the tidal barrage, the difference is that tidal lagoon uses a hollow cylindrical structure to create the difference in water water level on opposite sides of wall instead o the the long barrage. Tidal lagoon structure is just like a huge hollow cylinder with one or more holes from which water enter and leave the cylinder. These holes have a turbine installed at the half thickness of the cylinder and have capability to produce electricity by rotating in both direction. Tidal lagoon is install in places in which a water level increase and decrease frequently. When water level increase it start to gather around the walls of the cylinder and as the water level increase potential difference increase on opposite sides of the wall. As water have only few places to enter in the lagoon so it exert all the force at that point.When water start to enter in the lagoon, kinetic energy of the water in transfer into the rotation motion of the blades of the turbine and so the turbine produce the electricity. 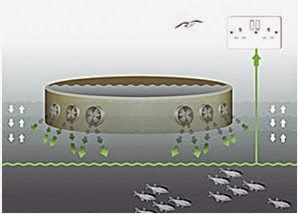 When water level decrease, water present in the lagoon start to leave the lagoon the same points from which it enter and so turbine rotating in opposite direction and produce the electricity.